Last edited by QuiltnNan; 05-23-2013 at 07:46 AM. Your quilt is beautiful! I'd buy a raffle ticket on it!!! I think the dark blue would make a nice border. I am particular to flying geese. You have so much going on it the quilt that maybe just a plain border would set it off nicely. My choice would be a dark fabric for the border. 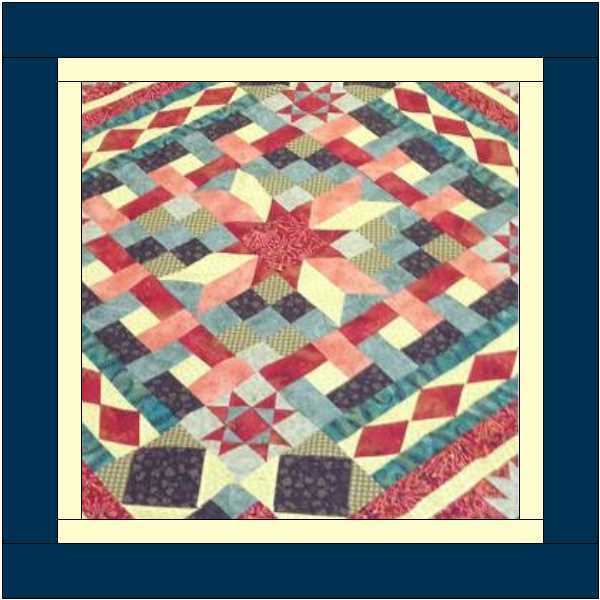 There's a lot going on in the quilt and a dark (reads solid) border will let your eyes rest. I'm will alleoop a small plain dark blue would make a nice resting place for the eyes. just my 2 cents worth. love the quilt. Beautiful quilt. I agree -- dark plain border would be best. Congratulations on a job well done and best of luck on the raffle ticket sales. You could just bind it as is. I think that last border you have on now is really nice and could be your final border. What a gorgeous quilt! Can I buy a ticket? It's a lovely quilt ... bind it the way it is now. I like the dark turquoise fabric and think it would make a nice border, then use a dark blue for the binding. And I would buy tickets, too. Beautiful quilt. Unless you want it bigger, I would bind it just the way it is. It should make a lot of money for your guild. 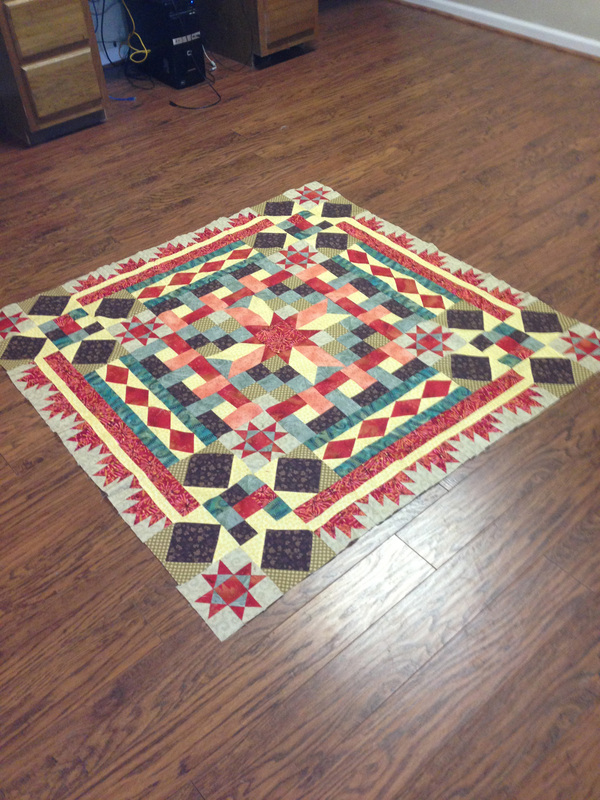 I like the red for the final border and binding. I, too, would like to buy some tickets. thanks for all the suggestions i was thinking of a solid for the border also would really like to make it bigger will post pictures when finished and would love to send you some raffle tickets when we have them available. Very pretty so far! It looks square right now and I prefer rectangles for quilts so I would add a a row of the center red stars to the top and bottom. Then I would add a red order all around? It would also look nice with the square set on point and triangles added especially if you did intricate quilting in the triangles. My first thought - doesn't need another border. The one on it is beautiful as is. It really is a great top. I agree with Mck here, it doesn't need much. Beautiful! I would bind at this point with a dark binding to frame it. I would go with a dark blue solid border. Lovely quilt! I think of your dark colors would look nice. Why does it need a border? I love it just the way it is......any one of the fabrics would make a nice binding. Love your quilt! Gorgeous quilt! Love the color combination! I would audition 2 plain borders. First, a narrow one in a color not in the outer edge. Try yellow, turquoise or coral here. For the second, I would try a wider border in one of the reds or the dark blue/black??? One of the combinations will please you more than the others. Last edited by KarenK; 05-23-2013 at 04:46 PM. If it's large enough, I think it would look complete with just a binding added to it.